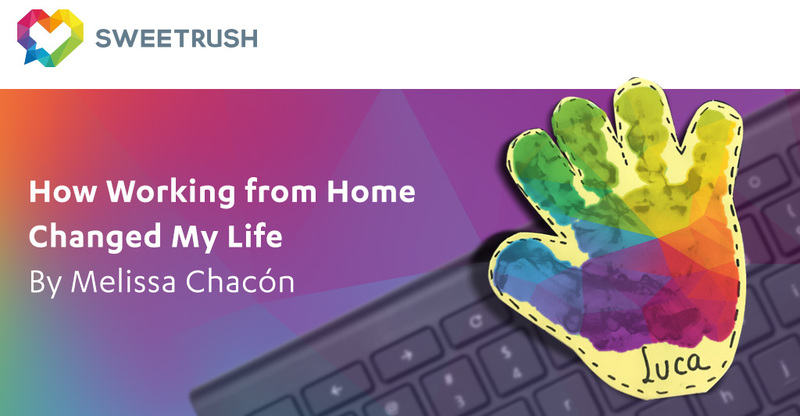 One SweetRushian’s story of how working from home helped her balance work and family. I feel very fortunate that throughout my career, I’ve had the privilege of working at great companies doing what I love most: recruiting! When I first applied for an internship in Human Resources, I thought to myself, “Bah! HR sounds so boring.” I couldn’t have been more wrong. I ended up recruiting IT and creative rock stars at a digital agency, surrounded by the coolest people and personalities. It was so much fun to go to work every day, and I couldn’t believe they were paying me, too! That was the beginning of my passion for working with people and making a perfect match between a candidate and the employer—a passion that only keeps growing with time. A couple of years ago, things were going great at work, and I knew I was on the right career path. Those days, I spent most of my time working and learning how to do my job better and better. Well, to be honest, a good portion of my day was not spent at work, but not by my choice! Here’s a fact you may not know if you don’t live in or have never been to Costa Rica: the amount of cars in the city at rush hour is insane! During my morning and evening commute, I was spending about 3.5 hours every day trapped between cars, which wasn’t fun. In spite of this , I loved my job. Also, since my friends around me with professional careers were doing the same thing, I assumed this was the way it had to be. And then something amazing happened. Ever since I was a little girl, my biggest dream in life was to become a mom and have a family. And then one day I received life-changing news: I was pregnant. With this news, I faced a huge challenge: I knew I wanted to keep working because I love what I do, but at the same time, since I had waited so long to become a mom, I didn’t want to miss a single second of my baby’s life. What would I do? I started looking at my options, and then I came across an ad for a recruiter position at SweetRush. Since my background was in digital agencies, I didn’t know much about eLearning. What caught my attention in that moment was the possibility of working from home and being present in my baby’s life. Here was a company that is completely virtual—meaning everyone works remotely! I had visions of giving up the horrible commute and spending more time with my new family. Well, I followed my heart and decided to quit my job. A few weeks later I started at SweetRush as a recruiter. I still didn’t know what to expect from this company, so unlike others in Costa Rica. Would I enjoy this field and my job as much as I did before? I’m not going to lie: the first 15 days were a combination of going crazy between my baby and work, and trying to adapt to not having anyone around besides my laptop. Yet I found myself adjusting to this new type of work. People were so kind and embracing that it wasn’t hard to feel welcomed in a virtual environment. I loved the flexibility of being able to organize my daily personal tasks with my job, and now it just works out naturally. I work with talented people every day, and the field we’re in, performance improvement, is all about helping people learn and become better at their jobs, which ultimately improves their lives. The part I play in that—helping find the very best candidates to grow our team—makes me feel good! I always say to candidates who are considering a position at SweetRush that I never knew it was possible to have an amazing balance between your personal life and work life before I worked here. When SweetRush says, “We care,” which used to be our tagline and is a very strong part of our culture and values, we truly mean it. Now I’m not only working doing what I love but also dedicating time to my family and to other hobbies that keep me happy and healthy. I’m glad I took that leap of faith, but more than anything, I’m thankful for this life-changing opportunity. This is the future of work, and I just hope more people take advantage of it. Melissa Chacon is a talent sourcer at SweetRush, working in the Talent Solutions team. If you are interested in open positions at SweetRush, please visit our Join Us page! Curious how other SweetRushians like working from home? Visit SweetRush’s Instagram account and have fun! One SweetRushian’s story of how working from home helped her balance work and family. I..
Have you ever experienced an interview process that makes you want to sign a contract..